Instant download products state this in the listing description. They are also in categories that have 'Instant Download' in the category title (in the menu at the top of the page). If an item does not say that it is an instant download, or if you are required to enter personalisation (such as a monogram or colour choice) at the checkout, I will email you the files within 48hrs (usually less than 24). Download links are good for 30 days OR up to 3 downloads (whichever comes first). Please download and immediately save files onto your computer. Once download links have expired they cannot be reset and you will need to purchase the item again. Instant download files are NOT sent via email due to the time involved. 4. Click the names of each folder (in bold) to download. If the folders do not automatically pop up once they have finished download, ensure pop-ups are not disabled in your internet browser. I recommend using Google Chrome or Fifox. You can also go to the 'Downloads' folder of your computer and search that folder for the files. 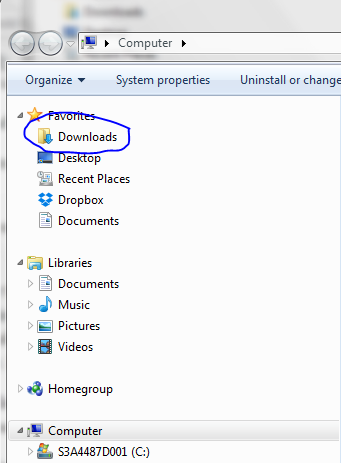 If they folders do not automatically pop up when they have finished download, go to the downloads folder of your computer. Go to the start menu (bottom left) then ‘Computer’ then click on Downloads. All the files you have downloaded (such as from the internet, from emails ect.) will be in that folder. There is a search menu you can use to search the name of the product e.g. travel planner, stickers ect. If you still can’t find the files you may have accidentally deleted them. Go to your desktop by clicking the button circled in the image below on the very bottom right of your start menu. This will bring up all the files you have deleted on your computer. I recommend cleaning this out if you have a lot as they take up valuable space on your computer and the more programs and files you have, the slower your computer will run. In the recycle bin you can search for the name of the set or the printable using the search box (top right). Click here for another tutorial on how to download and unzip files. If you are having trouble opening zipped folders, please see the information below for a step-by-step how to. I am using windows 7. Note that pop ups should NOT be disabled in your internet browser as this prevents files from downloading. If, after the file you have downloaded is finishing downloading does not automatically pop up, go to the downloads folder of your computer. Then double click on the zipped folder to open. 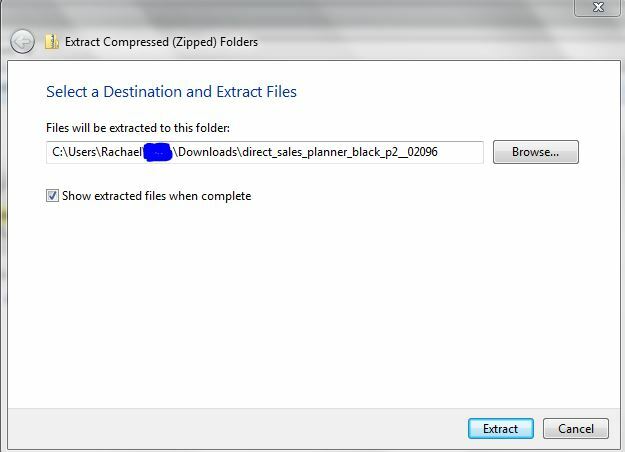 For the Direct Sales Planner files, each part is sorted into folders by type e.g. contacts, cover and dividers (they are split into 5 parts as this is a huge set). This is not the case for all sets so when you double click to open, each individual PDF file may appear..
You can now use the files! If neither of the above work I recommend downloading a program such as Winzip.